In the 85383 zip code of North Peoria, Arizona, you will find a truly remarkable community known as Terramar. Terramar is a beautiful place surrounded by breathtaking mountain views and a long list of outstanding amenities and conveniences. When you buy a home in Terramar you are poised to enjoy the area’s beautiful parks, exceptional schools, and so much more. 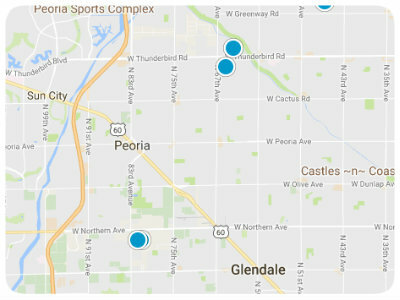 Among the many noteworthy destinations in close proximity to Terramar is The Peoria Sports Complex, which is only fifteen minutes away. The Complex serves as the spring training facility for the Seattle Mariners and the San Diego Padres. Lake Pleasant is also only fifteen minutes away, along with its endless opportunities for recreation, on and off the water. Other points of interest include the Sunrise Mountain Public Library, which is only minutes from Terramar, and the Phoenix Sky Harbor Airport, which is approximately thirty miles away. Schools serving the Terramar community include Terramar Elementary, Happy Valley School, and Mountain Ridge High School. This delightful subdivision is also in relatively close proximity to Glendale Community College North and Arizona State University West, making it a great choice for homebuyers with children of all ages. Beyond the entertainment, recreation and education opportunities, Terramar residents also enjoy great shopping options at places like the Arrowhead Mall, Super Target, Kohls, and other major retailers. Dining options near the Terramar community include local eateries like Lakeside Bar and Grill, as well as chain restaurants like Chili’s, Papa John’s Pizza, Panda Express and Chipotle Mexican Grill. As if all of that isn’t enough to make you want to buy a Terramar home, this spectacular subdivision is set amidst an abundance of natural beauty and enjoys 300 days of sunshine each year. Homes for sale in the Terramar community vary in size and architectural style, as well as listing price. But with all of these wonderful amenities, an amazing location, and diverse real estate, Terramar is worth considering when looking for a home in the Valley of the Sun. If you would like to learn more about the homes for sale in Terramar in Peoria, Arizona, please allow us to assist you and contact us today.